sensitive, high throughput, and economical alternative to conventional colorimetric methodologies, such as Enzyme-linked immunosorbent assays (ELISA). ELISA employs a label enzyme and a colorimetric substrate to produce an amplified signal for antigen, haptens or antibody quantitation. This technique has been well established and considered as the technology of choice for a wide variety of applications in diagnostics, research, food testing, process quality assurance and quality control, and environmental testing. The most commonly used ELISA is based on colorimetric reactions of chromogenic substrates, (such as TMB) and label enzymes. 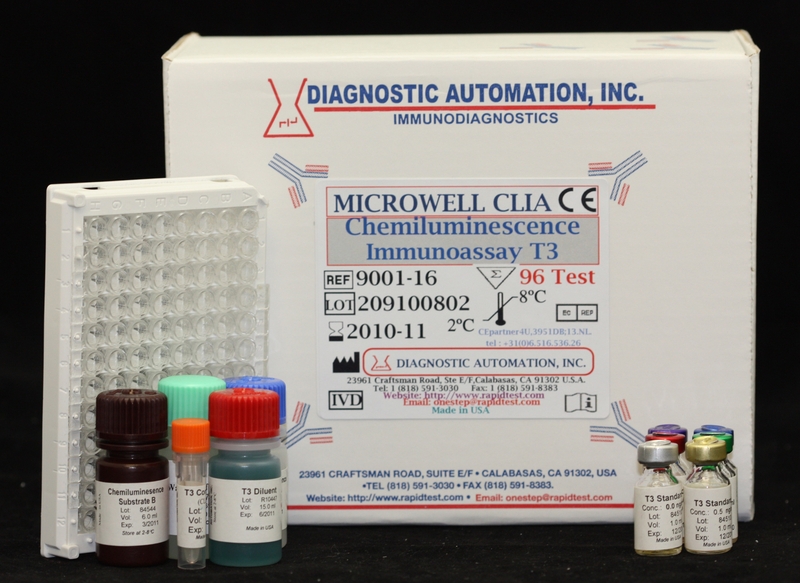 Recently, a chemiluminescent immunoassay has been shown to be more sensitive than the conventional colorimetric method(s), and does not require long incubations or the addition of stopping reagents, as is the case in some colorimetric assays. Among various enzyme assays that employ lightemitting reactions, one of the most successful assays is the enhanced chemiluminescent immunoassay involving a horseradish peroxidase (HRP) labeled antibody or antigen and a mixture of chemiluminescent substrate, hydrogen peroxide, and enhancers. 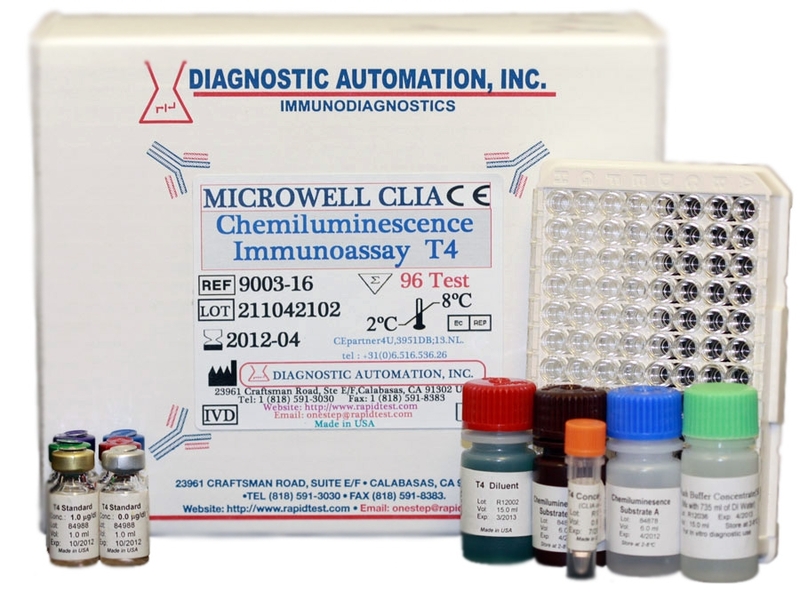 The CLIA Kits are designed to detect glow-based chemiluminescent reactions. The kits provide a broader dynamic assay range, superior low-end sensitivity, and a faster protocol than the conventional colorimetric methods. The series of the kits covers Thyroid panals, such as T3, T4, TSH, Hormone panels, such as hCG, LH, FSH, and other panals. They can be used to replace conventional colorimetric ELISA that have been widely used in many research and diagnostic applications. 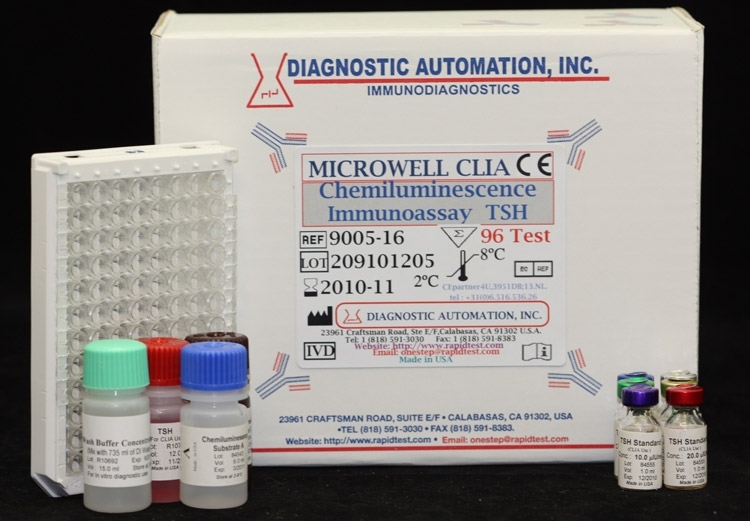 Furthermore, with the methodological advantages, Chemiluminescent immunoassay will play an important part in the Diagnostic and Research areas that ELISAs cannot do. The CLIA Kits have been validated on the MPL1 or MPL2 microplate luminometer from Berthold Detection System, Lus2 microplate luminometer from Anthos, Centro LB960 microplate luminometer from Berthold Technologies, and Platelumino From Stratec Biomedical Systems AG. We got acceptable results with all of those luminometers. unbound state in blood at any one time. Diseases affecting thyroid function may present a wide array of confusing symptoms. Measurement of total T4 by immunoassay is the most reliable and convenient screening test available to determine the presence of thyroid disorders in patients. Increased levels of T4 have been found in hyper-thyroidism due to Graveâ€™s disease and Plummerâ€™s disease and in acute and subacute thyroiditis. Low levels of T4 have been associated with congenital hypothyroidism, myxedema, chronic thryoiditis (Hashimotoâ€™s disease), and with some genetic abnormalities.